Chiefs and Patriots - One of 'em is Going Bowling - Do You Know Who? We’re down to the final four in the NFL playoffs, and this is where things start to get interesting. We’ve got the best teams in football going up against one another this weekend for the right to compete in the Super Bowl, and we couldn’t be more excited. One half of the equation will be determined on Sunday night, as the New England Patriots and the Kansas City Chiefs face off in the AFC Championship Game. Kansas City will be hosting this encounter, and it’s safe to say that they find themselves in a high-pressure situation. They’re considered to be the favorites in the eyes of many out of the four remaining teams to lift the Vince Lombardi Trophy up high, and with a 12-4 season followed by their comprehensive win over the Colts last weekend, it’s not hard to see why. Alas, anyone who takes it upon themselves to rule out the New England Patriots is a fool and it really is that simple. They put together an 11-5 season which saw them rise to the top of the AFC East once again, as we’re so used to seeing from New England. They also dismantled the Los Angeles Chargers last weekend in the Divisional Round. Think it’s going to look like this or think those roles will be reversed? All you’ve got to do is not be living under a rock to know that this game lives and dies by the performances of Tom Brady and Patrick Mahomes. It’s the biggest age differential between quarterbacks in NFL history, and it’ll be fascinating to see how the experience factor plays into this game. Logically speaking the young should always be favored over the old, but there are more factors in play than that. Then we come to the coaches themselves: Bill Belichick and Andy Reid. The football world wants to see Reid have his moment in the sunshine, but in the coaching sense, there’s absolutely no doubt in our mind that the Pats have the advantage here. Belichick could be coaching into his 90s and still be guiding this team to the AFC Championship Game, and often beyond. The next matchup is simple: Justin Houston vs the world. The linebacker could quite easily be the key to KC reaching the big one, if only because he tends to start dictating the pace earlier on than most. If he can get to Brady in the first quarter and set a benchmark for the rest of the game, then New England may be forced to think on their feet. Damien Williams is threatening to be the star of the show in this one, mainly based on the momentum he would’ve picked up from his magnificent performance against the Colts. Kyle Van Noy will be the man who is forced to deal with him if he’s pushed onto the inside, which seems like a pretty likely outcome. Be sure to check out Bovada, currently offering up to $5,000 in bonus money if you’ve got some bitcoin! Don’t have any bitcoin, but interested? Check this out to get started! We all know that it’s going to be close, but just how close are we talking? 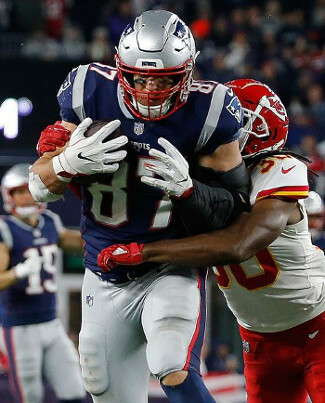 According to Bovada, there will be little more than a field goal in it, as they’re backing the Kansas City Chiefs with a -3 line in comparison to +3 for the New England Patriots. It’s a sensible bet given that it’s at Arrowhead, but just how much of a factor will the noise end up playing? It’s another fairly ‘play it safe’ type of spread from BetOnline, who have Kansas City as the -3 favorites. Their moneyline also gets behind the idea that the youngster Mahomes can make some magic happen, with the Chiefs being priced at -169 whereas the visiting Patriots are set at +149. 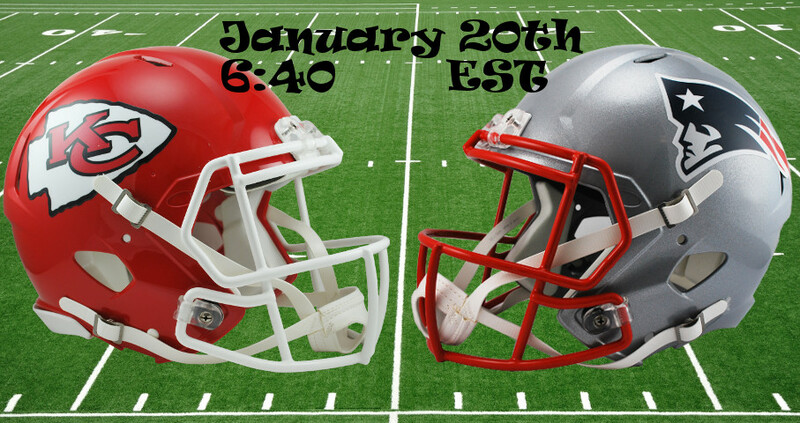 MyBookie are slightly more favorable within the realms of the moneyline at -150 (Chiefs) and +130 (Patriots), but again, they aren’t budging on the -3 and +3 spread. At this moment in time this is probably considered to be a wide gap within the confines of these two games, which should tell you all that you need to know about the NFC Championship Game too. If we take a step back for a minute and analyze the whole picture, the Chiefs are priced at +190 with MyBookie to end up winning the Super Bowl, making them second favorites overall, with the Patriots not being far behind at all at +200. One way or another we’re going to see some big moments this weekend, and it certainly seems like there’s more value in the Patriots. After all, they’ve done this dance before. Did You Know You Can Bet on the Games Live?